Dark-Readers: The Malice by Peter Newman blog tour + Giveaway! 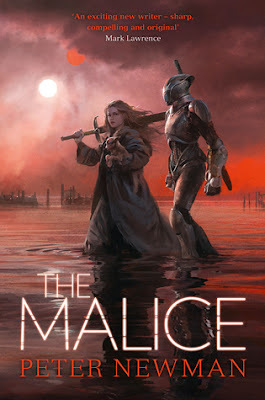 The Malice by Peter Newman blog tour + Giveaway! Synopsis: In the south, the Breach stirs. First off let's start this with some cover love...because well look at it! Its beautiful! And not only for this but for The Vagrant as well. Both have these evocative covers, so striking they jump out at you from the page...the bookshelf, from wherever and make you want to read them. Everyone always said don't judge a book by its cover, but if we didn't we'd probably not read half the books we do. And boy am I glad I've found this series. The writing here is so rich, giving you so much without having to physically give it to you underlaid with those moments of humour that just added a lift without even needing it. Mainly from the Goat, who has character for days! I fell into the story, one which packs so much in (through multipl timelines because you gotta get that brain working). From characters to setting, ideas and ideologies that blend together effortlessly to create these amazing worlds in such high fantasy. There are all these elements that I feel are draw from across the genre (even adding elements from other genres) but making them their own. Normally I can find blending elements like sci-fi and magic together but here it made sense, it wasn't extremes of one or the other but they worked in harmony. Vesper was a great protagonist. We saw her toward the end of the Vagrant but this really is her story. She completely changes the tone from the vagrant which is just what the doctor ordered. She started off as this fiesty girl wanting to push the lines, who then jumped into a situation that was bigger than she could ever expect. Standard genre, but she lead well. you got to journey with her, she was vulnerable, she wasn't perfect and had to grow into who she becomes through those around her. Balanced against this you had Duet, and their love hate balance helped drive the pace forward. Duet was a strange character for me, because of her dual and then singular nature and she really had to grow on me. And the infernals! everyone likes a monster in fantasy and there was such a variety from the down and dirty ugly to the modern and sophisticated. That was the ability of this world! This is a fantastic read...grips you, pulls you in and doesn't let go! Bring on more from this series! And now you can read it toooooooooo because we're giving away three copies! The competition is open from NOW until Midnight Sunday...So get on it , get reading and let us know what you think!